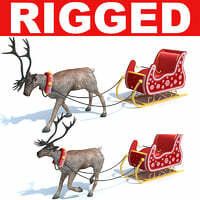 This 3d model of Reindeer with Sleigh is rigged and already joined to CharacterStudio Biped and ready for any animation. Suitable for games and sims, detailed enough for close-up renders. Originally modelled in 3ds max 9. Final images rendered with vray. The 3ds max zip file contains rigged model.